The growing demand for production efficiency is aiding the uptake of computer numerical controls (CNC) as these machines streamline various operational processes by reducing production time and minimizing human error. The highly competitive environment has compelled players to focus on efficient manufacturing techniques. They are also trying to gain competitive advantage by redesigning their manufacturing facilities to include CNC machines. The integration of 3D printing with CNC machines is one such addition to some of the new production units, which is expected to offer better product design with little to no resource wastage. Fueled by these factors, the global market for computer numerical controls is projected to grow from a value of US$52.6 bn in 2015 to US$93.4 bn by 2024. If these values hold true, the CNC market is expected to register a CAGR of 6.3% during the forecast period. Based on type, the global computer numerical controls (CNC) market is led by lathe machines and the segment is poised to dominate the market throughout the forecast period. The demand for lathe machines can be attributed to a wide application area. On the other hand, milling machines are anticipated to register a strong growth rate during the forecast period. Milling machines are compatible with a wide range of materials and surfaces and help improve overall efficiency. Furthermore, technological innovation has led to the development of advanced milling machines that can provide a more consistent finish to the products. In terms of application, the industrial segment held the dominant share and is likely to retain its lead through 2024. The growing demand for automated manufacturing in the industrial sector resulted in the increasing uptake of CNC machines. The establishment of manufacturing facilities in developing regions such as Asia Pacific has also spurred the usage of computer numerical controls in this sector. The automotive sector, on the other hand, is set to be the most rapidly developing segment in the coming years thanks to the soaring rate of automated automobile manufacturing. From a geographical viewpoint, the global market for computer numerical controls is led by Asia Pacific, with the region accounting for a share of approximately 35.0% in 2015. Developing economies such as China and India have been witnessing robust growth in terms of industrialization, thereby propelling the regional market. The automotive sector has been estimated to be register rapid growth in the Asia Pacific CNC market during the forecast period owing to the rising demand for automobiles in the region. In addition, the easy availability of labor and the declining prices of components have resulted in manufacturers shifting their production units in this region. This is further propelling the APAC computer numerical controls market. Considering that the U.S is the one of the earliest adapters of new technologies, the North America market for CNC machines is relatively saturated. Be that as it may, rising concerns over global warming and depleting energy reserves have led to the production of alternative sources of power such as solar, water, and wind, and this has significantly upped the demand for computer numerical controls in the region. CNC machines are actively used in power generation as the process requires wide-scale automation. The prominent players operating in the CNC market include Fanuc Corporation, Haas Automation, Dr. Johannes Heidenhain GmbH, OKUMA Corporation, Siemens AG, JTEKT Corporation, GSK CNC Equipment Co. Ltd., DMG Mori Co. Ltd., Takisawa Machine Tool Co. Ltd., and Yamazaki Mazak Corporation. Computer Numerical Controls or popularly known as CNC are machines which consist of a mini computer controller. The instruction or the program are directly fed into the computer which is then stored in the memory. Based on the fed data, the machine works to manufacture the products. These machines are highly efficient and reduce the need for manual labor which is the key factor driving their demand in the global market. The emerging concern for cutting down the operational cost is resulting into the rising demand for automation in manufacturing. The use of CNC machine reduces the overall manufacturing time and limits the chances for human error. These factors are primarily driving the demand for CNC machines globally. Furthermore, the increasing need for smaller factory footprints is resulting into replacing the manually operated machines by computer numerical controllers. In addition, the CNC machines help in efficient mass production without the need for constant supervision. These factors are aiding to the growth of the overcall CNC market across the globe. However, these CNC machines are very expensive in nature which is hindering the growth of the market. Moreover, the cost associated with maintenance and service of these machines is also high. These factors are pulling the growth of the market during the forecast period. Nevertheless, the gradual shift in the trend of manufacturing has led to the creation of interconnected machines to improve the output and reduce the overall workload. These factors are expected to drive the market for CNC machines in future. The global computer numerical controls (CNC) market has been categorized into machine types, application and geography. In terms of machine types, the market has been segmented into lathe machines, milling machines, lasers, grinding units, welding machines and winding machines among others. These machines find their application in several areas such as automotive, industrial, power and energy and defense and aerospace among others. Geographically, the global computer numerical controls (CNC) market has been segmented into five strategic regions which include North America, Europe, Asia Pacific, Middle East and Africa and Latin America. The report covers a complete regional analysis of all the above regions by discussing the market behavior of the different segments in terms of their revenue. The increasing industrialization and the emerging concern for automated manufacturing facilities have resulted in the strong demand for CNC machines in the Asia Pacific region. The region is expected to dominate the global CNC market during the forecast period. To have a better understanding of the market, the key trends affecting the demand for CNC machines have been discussed thoroughly. In addition, the challenges effecting the growth of the market have also been provided. Moreover, the push and pull factors in the global market have been analyzed with the market dynamics which includes the drivers, restraints and opportunities. Furthermore, the porter’s five forces analysis have also been included in the scope of the study. In addition, the future scope of the market has been anticipated with the help of market attractiveness analysis. The study tracks the global computer numerical controls (CNC) market in terms of revenue (USD million). 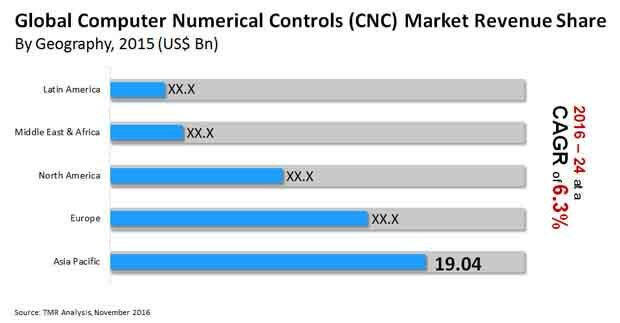 The global computer numerical controls (CNC) market is witnessing intense competition from its major players. These players undergo frequent mergers and acquisition in order to sustain in the competitive environment. For the better understand of the market, the market share of the leadings players have been provided in the report. The dominant and the emerging players present in the market include Fanuc Corporation, Haas Automation, Dr. Johannes Heidenhain GmbH, OKUMA Corporation, Siemens AG, JTEKT Corporation, GSK CNC Equipments Co. Ltd., DMG Mori Co. Ltd., Takisawa Machine Tool Co. Ltd. and Yamazaki Mazak Corporation among others.